So, the world didn't end when the Mayans said it would. But that doesn't mean that the popular Mayan ruins in Riviera Maya, Mexico, Chichén Itzá, Tulum, and Cobá, aren't still worth a visit. The Mundo Maya, which also include the countries of Belize, Honduras, and Guatemala, saw tourism numbers rise during 2012, and now that things have calmed down a bit, you'll want to check out these unique sites. After a long day of exploring, a refreshing dip in a cenote, or natural well – the Riviera Maya is full of them, is the perfect way to cool off. And, aside from the ruins, the Riviera Maya is becoming a popular adventure travel destination, with an array of opportunities for hiking, diving, and cave exploration. One word of advice: If you're thinking about a visit in 2013, book now. Chichén Itza: The biggest and most popular ruins in Mexico, this UNESCO World Heritage site was named a 7th Wonder of the World in 2007. Not surprisingly, the ancient Maya city is teeming with tourists. It’s still worth a visit, though – for first-timers (like me), stifling a gasp as the 79-foot Castillo (El Kukulcán) comes into view is nearly impossible. The temple is famous not only for its grandeur but also for the various symbols of the Maya calendar represented in its features: a total of 365 steps, for example, and the shadow of a serpent slithering down the stairs that appears during equinoxes. And those people who are clapping at the base? They aren't reenacting some ancient Maya ritual; they’re demonstrating the echo from the top of the temple that sounds eerily like the call of the quetzal bird. It’s a highland creature not native to the area, so whether the remarkable acoustic effect is accidental or was designed by the Maya is up for debate. Two more recommended stops: the ball court, which at 443 feet long is the largest in the Mundo Maya (though some archaeologists say it was used more for ceremonial purposes than actual games), and the Sacred Cenote, a short walk from the main city. This 100-foot-deep natural well is the eternal resting place for more than a hundred sacrificed Maya, including many women and children. 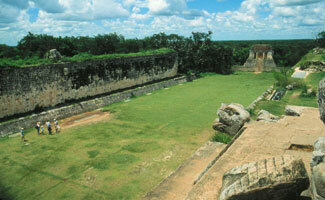 Chichén, as it's commonly called, is about a 2.5- to a three-hour drive from Playa del Carmen. To avoid the largest crowds (and the mid-day heat), set the alarm early (or plan to arrive after 3pm). Or, stay overnight at any of several mid-range hotels, as well as some hostels, in the nearby town of Pisté, or at the actual on-site property, The Lodge at Chichén Itza, and be among the first inside when it opens at 8am. Cobá: These delightfully shaded ruins are famous for an inscription that indicates a date far exceeding that of modern astronomers’ estimates for the age of our universe. At the site’s Stela 20 (a stela is a sculpted stone shaft or tablet; look for signs to Structure 5), this "deep time" inscription is evidence that the Maya marked time past December 21, 2012, which represents not the end of the world, but the end of their Long Count calendar and the beginning of a new era. In addition to this significant inscription, Cobá also boasts the 42-meter Nohuch Mul, one of the tallest temples in the Mundo Maya, whose steep, vertigo-inducing steps (I counted 124) visitors are allowed to climb. With no guard rails or official guides on hand, it’s an ambitious grind to the top – the rope is there for a reason – that comes with beautiful views of the Yucatan forest, bragging rights, and, even if you’re in decent shape, likely a day or two of sore quads. In addition to the heart-pumping temple climb, Cobá, which is about a two-hour drive from Playa del Carmen, evokes a somewhat wild, yet spiritual vibe with its leafy canopy, maze of "white roads," or sacbeob, which were the actual routes that the Maya walked upon, and scores of as-yet unexcavated structures. It’s normally much less crowded than other sites. Tulum: Set against the spectacular backdrop of the shimmering Caribbean Sea, Tulum boasts beautifully manicured grounds, an easily walkable site and even beach access. In other words, it’s an ideal choice for visitors who want to take in some ruins but get antsy after an hour or so. 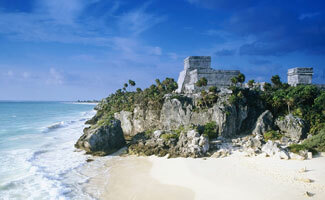 From an archaeological perspective, Tulum is significant because of its status as a hub of trade and commerce in the Riviera Maya. Structures of note include the often-photographed El Castillo, which is magnificently perched on a seaside cliff, the Temple of the Wind, whose rounded corners allowed the wind to flow freely around it as a sort of tribute to that god, and the Temple of the Frescoes, which shows different scenes of gods including Chaac, the ever-powerful rain god. In addition to the ruins, Tulum also refers to the quaint seaside town about a 30-minute drive from the archaeological site. It makes for a great home base to explore Cobá and Chichén, as well, with scores of quaint accommodations (one to check out is the exquisite Ana y José Hotel & Spa), chill beach bars and restaurants, and even yoga studios.